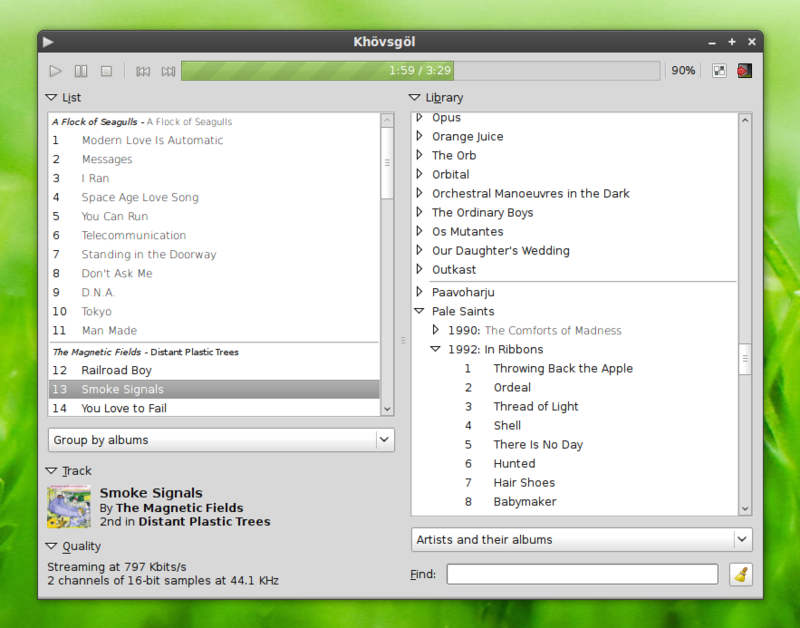 Khövsgöl is a minimal, highly configurable music player and browser, which can easily handle very large collections of music. It's designed for the GNOME desktop, but can run well in other environments. It works fine as a standalone player, but can also be used to remotely control music daemons such as MPD. Khövsgöl is designed to be sensible and straightforward to use. It lets you quickly access what you want to hear, while also helping you browse through your music collection when you're feeling indecisive. Change the organizational structure at the touch of a button: browse by artists, tracks, albums, genres, even decades. You can customize these structures to match how you think of your music collection. Searching is fast, even for very large music collections. If you have whole albums queued on your playlist, don't you get annoyed when other music players show you row after row of the same information? You would think there could be a more efficient design. Khövsgöl hides all this repeated information, and puts a clear heading over tracks from the same album. It can also recognize if the album is a compilation (has tracks by various artists) and display accordingly. Create your own playlists by dragging and dropping tracks. It's as fun as creating a mix tape! They'll appear in your music collection as albums. Your choice! Khövsgöl can index your collection according to their embedded tags. But, in case your tags are a mess, it can work according to a configurable directory and filename structure, such as "artist/album/track number - track name". If you can't be bothered with the vast amount of work required to carefully tag a large collection, but can handle moving files to the right directories and giving them consistent names, then Khövsgöl is for you. Khövsgöl is the name of a beautiful lake in Mongolia. One hopes that the purity of its waters will cleanse this software from bloat and detritus. The Khalkh Mongolian pronunciation of the word is as follows: "kh" is pronounced like the "ch" in Bach; the "ö" vowel is somewhere between a mid-Western American "oo" as in "booth" and a "o" as in "oar"; the "l" is a breathy sound, half-consonant, half-vowel, somewhere between an English "dark L" and a "th" sound, and somewhat like the Welsh double-L. Stress is on the first syllable.